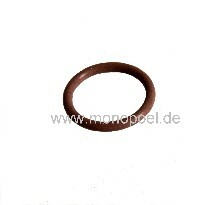 Copper washer for pressure valves of Mercedes-Benz row injection pump. A typical damage after some years of diesel use and a short time of the use of veggie oil, is a fuel leakage on top of the Mercedes-Benz row injection pump. As a result of a defect o-ring, air gets into the pressure valve when the enigine is cooling down. In consequence fuel returns from the fuel filter down to the fuel tank, thus resulting to tremendous starting trouble. For a 4-cylinder engine you need 4 pieces, for a 5-cylinder engine you need 5 pieces of o-ring and copper washer,etc. How can I change the sealings on top of the Mercedes-Benz row injection pump ? See "Datasheet/Info" below.